All transactions are safe and secure with a reliable history in online purchasing behind each of our associates. 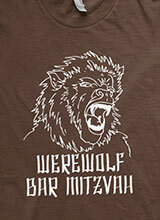 Buy the Werewolf Bar Mitzvah shirt to own 30 Rock clothing and merchandise. Tracy Jordan earned a Gold Record for his novelty party song "Werewolf Bar Mitzvah." The song is featured on the fictional album An Evening with Tracy Jordan produced by Geffen Records. In the episode, Tracy recalls the video for the song, in which he sings the lyrics, "Werewolf Bar Mitzvah - spooky scary, boys becoming men, men becoming wolves." Tracy is wearing a Thriller-esque outfit in the video and his face is made up to look like a wolf. Wear this 30 Rock Werewolf Bar Mitzvah t-shirt to let everyone know that you've been to the scariest coming of age party of all-time. In addition to the Werewolf Bar Mitzvah tee above, browse the 30 Rock Clothing Gallery for more apparel like men's and women's clothes, kids shirts or hoodies.